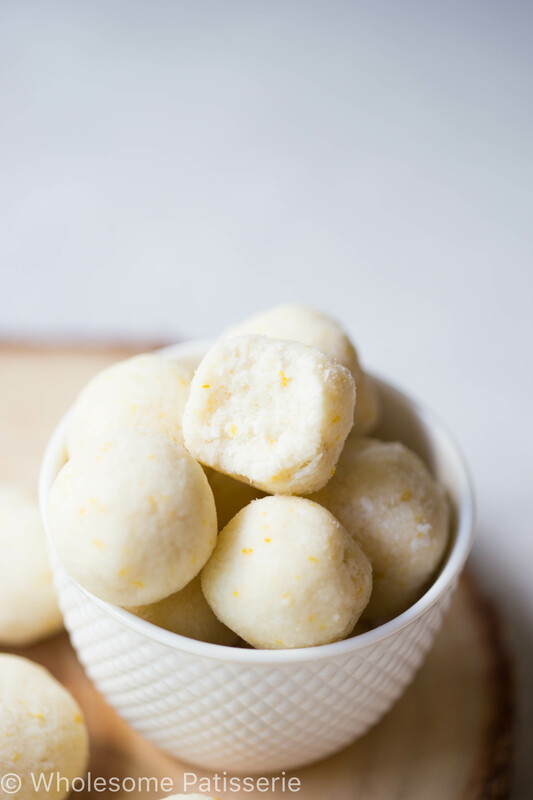 I’ve always seen these super white, fresh looking bliss balls over Pinterest yet i had never attempted to make them myself. 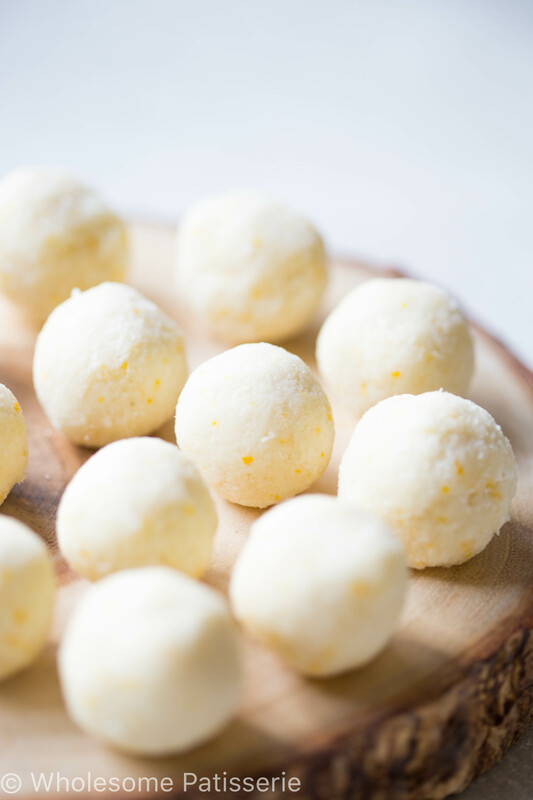 Of course i have made many bliss ball recipes but not ones that are pretty in white (oh they just look so magical don’t they?!). 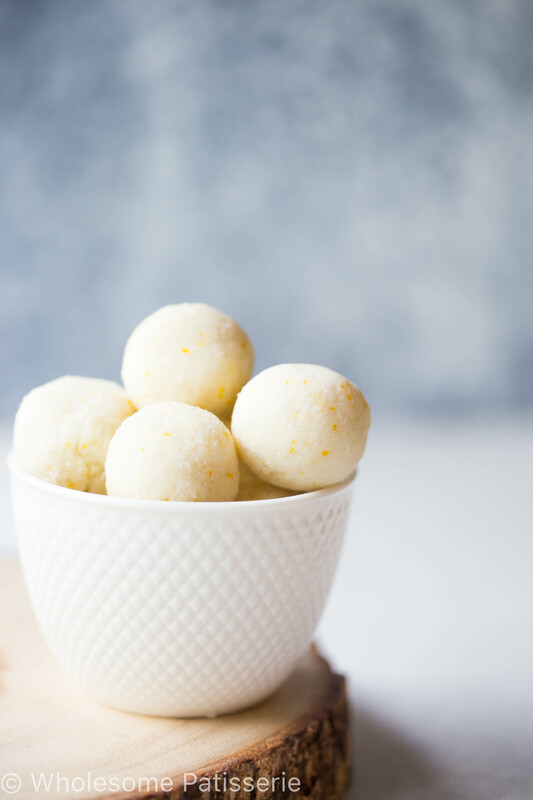 Introducing my Coconut Lemon Balls, a very simple and tasty treat for you to make. These beauties are gluten free and no bake. They came out exactly the way i pictured them! Now we all love bliss balls but since they are so incredibly easy, you want them to be absolutely amazing right?! Only 5 ingredients and you will have yourself a batch of beautiful, fresh, light, delicious sweet treats! There is no chocolate in sight which is very very rare for me. 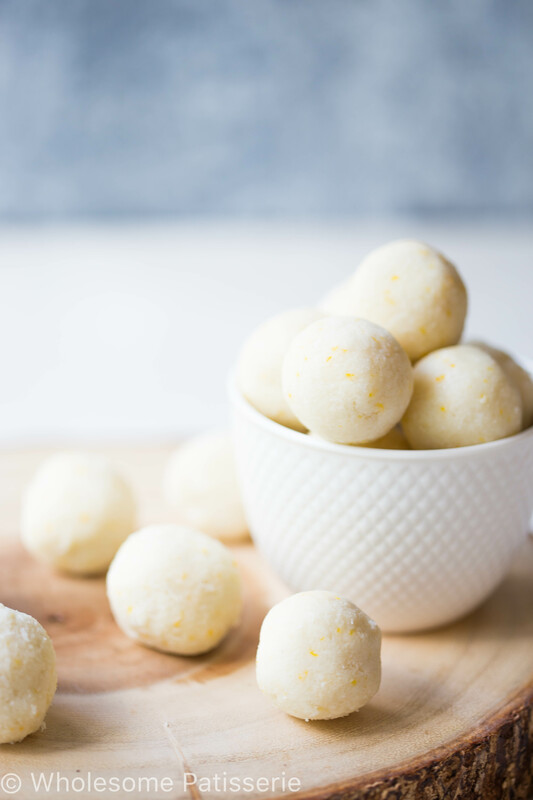 After making these coconut lemon balls, my mum mentioned to me that chocolate on them would be fabulous! I 100% agree because when isn’t chocolate a good idea..? So i welcome you to add chocolate to your bliss balls if you desire. Dip them in melted chocolate, drizzle them in chocolate or completely coat them in melted chocolate, the options are endless! 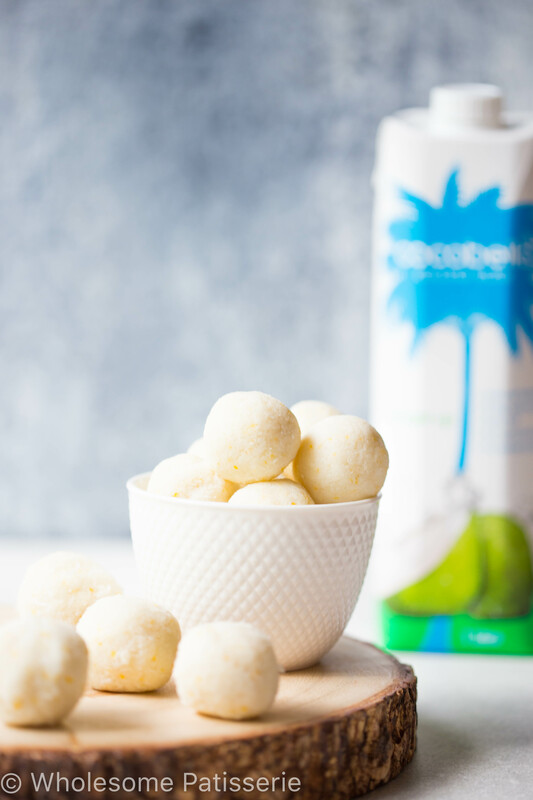 This is such a wonderful base coconut ball recipe with a touch of fresh lemon that it’s a great on-the-go snack idea and completely versitile! Now i did use honey in mine but if you want to make them completely vegan, just switch out the honey for maple syrup, simple as that! As you probably know by now if you have followed my recipes for the past 6 months, i do enjoy using coconut water when i bake particular recipes. Why? Because it’s great! Whenever you see a recipe call for a little water, try coconut water for added nutrients and flavour, you won’t be disappointed. My personal favourite coconut water is from Cocobella. Organic and straight from the coconut with no added sugar or preservatives, yasss… that is what you want! Let me know how you go with these little bites of deliciousness, enjoy! Add all ingredients to a high-speed food processor. Pulse a couple of times to incorporate ingredients then process on high until well combined and mixture begins to stick together. Pick up approx. 1-2 Tbsp of mixture to create small round balls. Add more desiccated coconut if mixture doesn’t hold it’s shape when formed into balls. Place on prepared baking tray, continue with remaining mixture. Set in the refrigerator for 30 minutes. Store in an airtight container, refrigerated, for 1 week – 10 days. You may need to add more desiccated coconut to the mixture if the balls begin to fall apart and won’t stick together when forming into the balls. Can i just used shredded coconut instead of desiccated coconut? Thanks for sharing! What is coconut cream? Hi there, I’ve just made some and they’re delicious! How long would they keep in the freezer? Thanks! Hey, sound great, do they freeze? Hi, I’ve just come across your recipe and found that you’re using “cocobella coconut water”. I live in Australia and have never heard of this product, so where am I liking to find it. In a supermarket, Asian store or health shop. Would love to try these for Christmas and I’m a real lemon lover. Hi there cocobella water can be found at IGA stores. I live in Melbourne and my local store stocks it all year round. I was a bit worried that these wouldn’t hold together (even though I didn’t try!) I melted a small chunk of cocoa butter and added that to the mix. They were really easy to work and held shape perfectly. Thanks for the recipe it is awesome! I am not vegan, but so you are aware if these have honey in them they are not vegan. I have never used coconut cream or coconut butter, where can I find them? Hi Jasmine! Congratulations on the weight loss! You can find coconut cream, coconut butter, coconut milk etc. from any health food store. Regular supermarkets also sell these products, mostly in the Asian food aisle. I prefer to purchase organic so that is why I get mine from my organic health food store. Hi, I made these 3 times in 3 days cause I love them so much! instead of shaping into balls, I pressed the mixture firmly in a rectangular plastic box, leaving an inch of space so to pull them effortlessly and froze them for an hour. Amazing! I wonder if I can make them with oranges instead of lemons? Can I use coconut butter in place of coconut cream? Dying to make these. Hi. Have just tried making these but with no success. They wouldn’t come together. I added more coconut cream then tried coconut oil but nothing worked??? Hi Victoria, try adding more of the desiccated coconut instead. This will help them hold their shape where as the liquid will make them more sloppy if too much is added. Alternatively, add more of the honey, one tablespoon at a time, if the additions of the coconut still aren’t working. Hope this helps! in my recipe at home, I use 1 to 1 coconut cream(manna) and dried coconut flakes. It creates a nice creamy treat. These look amazing! I want to make for the kids lunches do you think they will melt if not refrigerated? Fantastic they will love them. I was just about to make them and realised I have loads of coconut milk but no cream. Back to the shops I go! Love the use of coconut water in these! I’ve got some leftover coconut from making coconut milk that I’m thinking are going to end up as these.